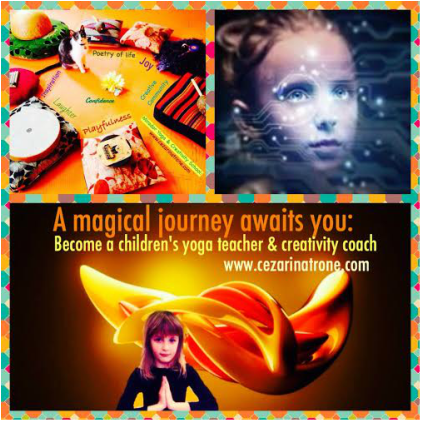 This 95 hour specialized kids yoga and creativity coaching teacher training certification combines independent/online learning and empowering coaching calls with energetic & super creative modules for face to face instruction. Every module counts towards CEUs for yoga teachers (RYTs) who need continuing education units every three years as well as towards your 95 hour Children's Yoga Specialty with Yoga Alliance. Training Hours can also be used as professional development CEUs for educators. Read testimonials from our Graduates here. & An Awesome Creativity Coach! Please know that each Module of Training counts towards your Registered Children’s Yoga Teacher Certification with Yoga Alliance. With each Module/Weekend you are earning your way to the highest level of training for Kids Yoga Teachers. "This training is unique in that it equips you with tools for a magical life (these tools and resources were tried and true to Cezarina's own life journey: three years of activating and nurturing her own Creative Source Energy while living and teaching in West Africa, then five more years of integrating her own coaching model into simple, yet powerful daily practices, along with almost 3000 hours of hands on inspired practice of yoga and creativity with kids and adults alike.)" Our 95-hour Mirador Yoga Teacher Training & Creativity Coaching Program is internationally accredited through Yoga Alliance & will get you started on your journey of becoming a Registered Children's Yoga Teacher (read more about Yoga Alliance Standards here...) Our Training and its individual modules are open to anyone regardless of whether or not they want to become certified. You can plan to take only as many CEUs as needed. To determine if this training is exactly what you have been looking for, Cezarina offers FREE 20 minute consultations. Pure Magic, Ease & Flow!